Four members of the Galaxy series launched a new family within the contiguous. After the Samsung Ace and Galaxy Mini, now turn Samsung Galaxy Fit and Gio fourth is an effort of this Korean vendors to market their Android phone OS in all circles, including the middle class with more affordable price. usually, most of the phone operating system is still fairly expensive. Samsung Galaxy Fit and the Gio can be said like twins but not identical. both have quite a lot in common, leaving only a little difference. 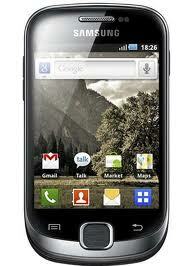 In terms of price, Galaxy Gio sold cheaper than the Fit, but with a slightly more powerful processor. Fit a more expensive price is not without reason, because it has a higher camera resolution and wider screens. Display Samsung Galaxy Fit is unlike any other touch screen mobile phone. Advances dominate the big screen phone, equipped with three buttons at the bottom. Two haptic buttons: menu and back and a physical button: home, be a supporter of the performance of this smart phone. 3.31-inch screen size occupies the face of the phone dimensionless 110.2 x 61.2 x 12.6 mm. Dimensions quite proportional to the level of minimal thickness. feels quite comfortable to hold. On the side there are volume control buttons, power button, and microSD slot. At the top stay microUSB port and 3.5 mm audio jack. as usual, the back there is a camera lens and speaker holes. Plastic casing used on the front, appear shiny with a list of metal around it. On the battery cover, textured plastic casing that feels pretty rough outline in hand. Its surface is not slippery so easily opened. In the market there are two options casing color, namely black and silver.